Imagine you were to draw a definition of the conceptual experience of ‘time’ in a purely abstract and neutral manner. No figurative symbols, no sensual expression, no emotional interpretation. Might need some time to think about it first? HANNE DARBOVEN dedicated her whole life to working on that idea and thus created a seemingly ceaseless opus of minimalist conceptual art in the late 20th century. A retrospective on the German artist at CAMDEN ARTS CENTRE now gives insight into her unique universe of momentum and eternity. 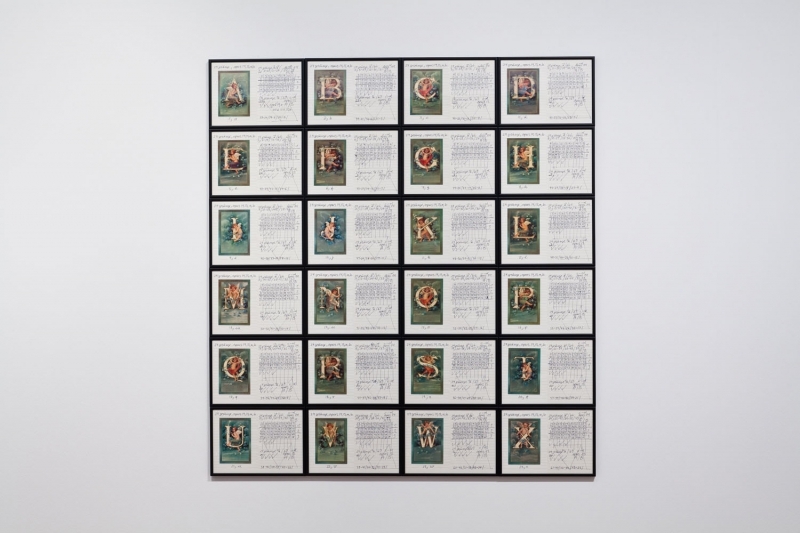 At first glance, HANNE DARBOVEN’s paper-sheets offer nothing aesthetically appealing, unless for the autistic mind: just numbers and scribbles in perfect order and regularity, some in pyramidal placement, others combined in equations. And each ‘piece of art’ consists in a formation of several of those sheets for whose hanging a principle of order applies as well. Order and perfection: German stereotypes seem to hold true. But in taking a closer look at the notes one realizes that the structure is not simply a formal visual arrangement, but that the numeral lines and rows make sequences. And they are mainly written on calendar sheets with the checksum of dates rendering the relevant numbers for the calculations. Obviously, there is an inherent system underlying the composition: the beauty of mathematics? 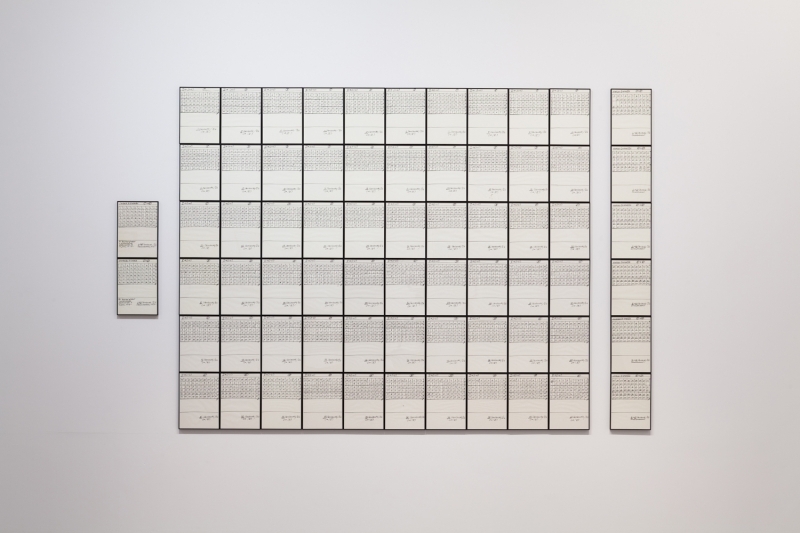 The exhibition screens three large-scale minimalist installations of DARBOVEN’s hand written tables of numbers; and large-scale has to be taken literal in her work. Although the biggest at CAMDEN ARTS CENTRE consist of a humble 305 drawings, bigger works like her ‘Hommage à Picasso’ showed 9,720 sheets. What is the sense in this megalomaniac obsession? There is an impression of repetition in the beginning but despite its resemblance no line DARBOVEN put down is ever the same since every single page is handwritten. So these are rather numerous variations of the same process that might differ from each other only slightly – by the paper-index identifying each execution. And this is just how a calendar works in measuring time: systemizing and using the date as a graphic equivalent for a moment in time. We can also frequently recognize the German word “heute”, meaning ‘today’, crossed out and thus referring to time spent. So there is an analogy to the complex idea of time: something that keeps relentlessly rerunning and still is unique in every instance. But that is still too superficial to really understand DARBOVEN’s work. As you skim through line after line, row after row, paper after paper slowly walking along the puzzle pieces while trying to decipher a code, finding yourself following the equations and finally discovering that every pretended scripture is in fact just an endless loop of a lower case handwritten ‘l’ – suddenly it strucks you like a lightening: this takes time! Literally: this takes not only time in capturing what you see but this must have taken huge time in making. Forced by the absence of meaning and obscurity of interpretation the viewer experiences her perception in the real-time of the production process. Simultaneity of the past and the present, the potential endlessness of an ongoing process, the uniqueness of the instant – suddenly all the big ideas around ‘time’ start slurring in your head. If you imagine that HANNE DARBOVEN devoted her daily routine to filling sheets (=finishing a day) you might well get a little dizzy. Immediately other works investigating the passage of time might be revoked: ALIGHIERO BOETTI’s ‘The 1000 Longest Rivers In The World’, the ‘Date paintings’ of ON KAWARA or ROMAN OPAŁKA’s lifework might be examples of an (deliberately) failed attempt to measure time. 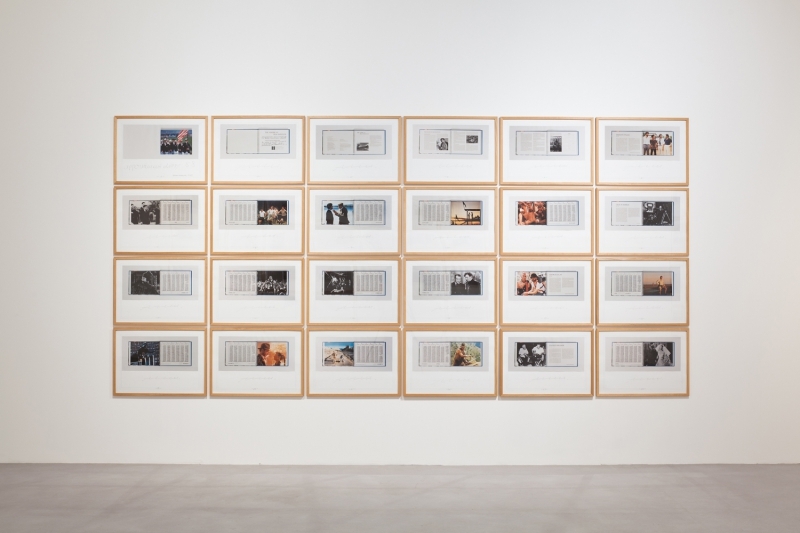 But HANNE DARBOVEN takes it a step further as she is not trying to disrupt an artificial order (the calendar), measure the immeasurable or putting a snap-shot out of context in order to make the viewer reflect upon time. She performs the double nature of time as a continuous flux and an embracing order. It makes sense now why DARBOVEN uses the neutral language of calculating and scribbling (without words): ‘writing’ thus becomes a spatial means to measure a temporal duration. There is a resemblance with text but no meaning, no interpretation, is given. Such, we might understand DARBOVEN when she says: “I write but I don’t describe. I write, but I don’t read.” The word “Schreibzeit” (‘writing-time’) is headlining many sheets, which is double-noun with a double meaning: the time passing during an act of writing and the time that is being written. It might be the most concise and fitting word to give DARBOVEN’s artistic oeuvre a title. In the 1980’s DARBOVEN, a classical trained pianist, starting composing ‘Mathematical Music’. There she equaled notes with numbers and thus transformed calendar dates directly into composition. The results sound very much like a hybrid of classical German baroque chorales and modern minimalistic music such as PHILIP GLASS or STEVE REICH. One of her pieces can be heard and seen in the second room at CAMDEN ARTS CENTRE. 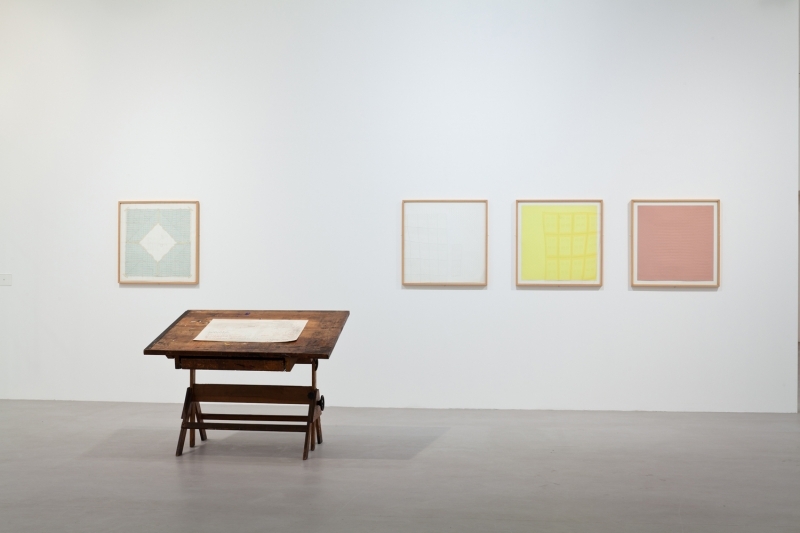 DARBOVEN’s subject is time, her form is writing. But having said that, has not given it meaning. You have to experience her art in order to understand it, you won’t get the content without the medium. And in facilitating such a philosophical experience of intuition without any emotional input at all, her work is indeed uniquely brilliant. You should immerse in DARBOVEN’s work with a fair amount of time, just throwing a glance at it won’t reveal the mystery of time.